After many requests I have decided to embark on a new venture with this quarterly report. My objective is to provide updated information on farm activities along with current news and analysis about Shorthorn management, nutrition, health, genetics, and reproduction. 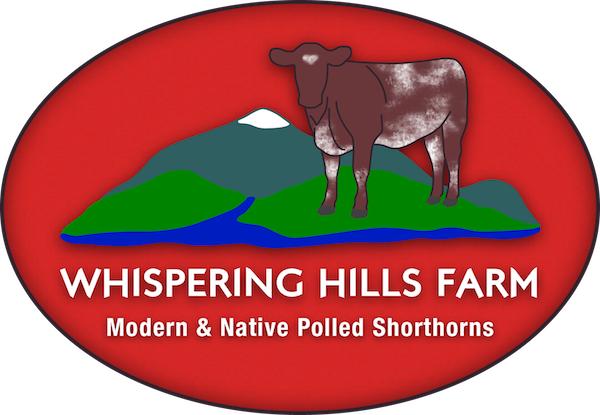 The Shorthorn Bulletin will be issued on a quarterly basis at shorthornbulletin.com, via email on request or can be viewed on our website whisperinghillsfarm.com through a link. The first calves have been born and will be listed on our website. Additional calves will be posted as they are born. December was extremely wet with record rainfall creating mud issues but fortunately our drainage system for the cows has worked reasonable well. I think the cows are in countdown mode till turnout on green pastures in late March. Grass and alfalfa hay will never substitute for green grass as far as they are concerned. We will have several bred brood cows for sale in the fall. Contact us regarding availability and pedigree information. We continue to add to our selection of old classic Shorthorn bulls from the 50’s,60’s and 70’s that will be utilized both in our Modern and Heritage Shorthorn breeding programs. Much has been made of the recent December Impact 2015 Shorthorn Breeders Conference in Kansas City to define the future direction of the Shorthorn breed. There is no question a dichotomy exists within our breed-show versus commercial Shorthorn type. The separation between breeder’s interests continues to grow because of economics, show judging and the changing cattle industry. In fact all of these factors have played a role in the rise of “Shorthorn Plus” or as I think they should be called-“Shorthorn Crossbreeds”. The “Shorthorn Show Industry” has no real practical application for the commercial cattlemen. To believe otherwise is to buy into the hype and the promotion. Show Shorthorn buyers often do not think of or ask about the maternal qualities that a cow needs to lead a long productive and trouble free life. Initial interest is simply in how well she might do in the show ring. There is nothing wrong with that but understand the limitations and that Show ring genetics are not practical commercial genetics. The average Show Shorthorn will never work in a commercial herd because the selection process is completely different. Your average pampered show cow does not know how to “forage” for herself and never would thrive under the range conditions most commercial cattle must endure. The whole idea of Shorthorn “Plus” Crossbreed has been to bridge this gap but also to appeal to the show steer market. Thus we now see black Shorthorn “Plus” Crossbreeds being promoted at sales and in the Shorthorn Country magazine. I would have no problem with this if the term Shorthorn Plus was replaced by the correct term Shorthorn Crossbreed. Apparently a lot of Shorthorn breeders have not learned the lessons of several other breeds of cattle that are now all black and have lost all semblance to the color and genetics that made them a distinctive breed. Crosses between Shorthorns and other breeds may have a place in the show ring or commercial market but they should be called Shorthorn Crosses or Composites so there is no confusion as to what constitutes a true Shorthorn. Many of Shorthorn breeders focusing on the commercial bull market have embraced what I call the “Red Angus Syndrome”. Their websites, their ads, and their sales have nothing but solid red Shorthorns. The purpose of this, of course, is to appeal to the whole “Angus Certified Beef” market where anything that does not have the right color is presumed inferior. What a joke although I totally understand the economics of it. Unfortunately this approach can permanently change the genetics, color patterns, and characteristics of what made Shorthorns Shorthorns. In one sense the commercial Shorthorn bull breeder is as guilty as the Show breeder in moving the breed away from its distinctive features. The result potentially being that Shorthorns are no longer Shorthorns. Some will say this is progress. I say it is dilution and adulteration. The Shorthorn Breeders Conference was supposed to merge the interests of Show and Commercial breeders and the ploy appears to be to emphasize EPDs (Expected Progeny Differences) allowing Shorthorns to be placed on the same EPD pedestal as many other beef breeds. This creates a whole other set of problems due to how EPDs are developed and utilized. EPD’s are primarily based on pedigree and production information provided by Shorthorn breeders with no real oversight. Inherently EPD’s can be inaccurate especially when differing management systems are not taken into account. For instance calf birthweight can be 10-15# higher or lower depending on the diet of the dam. That is a 20-30# swing. A range cow in Wyoming versus a “Show” cow in Iowa are likely to have radically different diets. Yet the there is no asterisk on the EPD data. I could go through a litany of problems with the different EPDs but I will discuss individual EPDs in depth, including the whole birth weight issue with its permutation, in a future Shorthorn Bulletin. Suffice it to say that EPDs can be helpful when they are developed within similar management systems but can be counterproductive when used in a cavalier fashion or used for single trait selection i.e. birthweight. Just look at the plight the Holstein dairy breed is in because of the emphasis on just milk production. Given all of the above is there any hope for Shorthorns or Shorthorn buyers. Yes! Breeders and judges should go back to fundamentals and look at what made Shorthorns the most popular breed in the world for over 100 years-their adaptability and genetic diversity. Characteristics such as docility, maternal instinct, grazing ability, milk production, marbling efficiency, and their innate beauty/color patterns (red,white, and roan). There is no doubt with proper selection, both genotypical and phenotypically, Shorthorns can have a profitable niche in the cattle industry. If they become only “Red or Black Angus” all of what makes them so special will be lost. Buyers should be looking for Shorthorns that match their management systems. If they want to just show cattle then look at “Show Shorthorns” but realize the limitations. Buying an ET show heifer raised on a recipient cow has no relationship to the ability of that heifer to have a long productive life. Buyers that want to raise grass fed beef need to buy from grass fed Shorthorn operations because the selection process has undoubtably produced heifers that will work in that environment. In summation don’t get hung up on EPD’s. Realize their limitations.